So Im back in Ireland after my trip to NYC..we flew through the night and the flight was delayed 2 hours and then had to get a bus from Dublin to Belfast which was another 2 hours. So Im deliriously tired as I write this and have no concept of what time it is... but I had THE best time! So until tomo... or possibly Sunday Ill leave you with my favourite instagram pics from the pass week in NYC..
#2 A little shopping in Bloomingdales & sampling a lot of American candies. #3 Magnolia Bakery: tried and tasted the vanilla, red velvet, peanut butter & jelly cupcakes. Pb & jelly were my personal fav! #4 Pretty view from the Highline, the old railway tracks turned into tranquil walkway & gardens free to enjoy & with amazing views of downtown. #5 The famous little cafe beside Grand Central Terminal. #6 The best hot chocolate ever ever! In the famous Hug Mug at Max Brenners. There white chocolate & oreo milkshakes were also damn good. so glad you could go there!! Welcome back! I love Max Brenners! Such a brilliant idea having a 'bar' devoted to chocolate and all things sweet. Very nice, hope to see all your pictures! We're going to new york next year - can't wait! 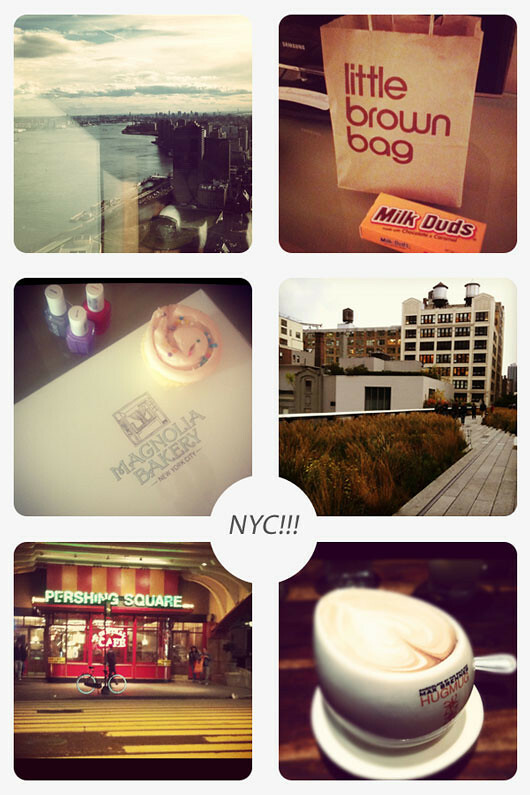 Lovely photos, so jealous, have always wanted to visit NYC! So glad you had an amazing time! Can't wait to hear all about it! Looks like fun.. sorry that trip back was not fun! This is a gorgeous look Vicki - you suit yellow so perfectly! <3 Can't wait to see your NY photos!